Herbal extract from the periwinkle plant. Increases neurotransmitter levels and activity in the brain. Recommended for stroke healing and prevention. Excellent for memory and focus in adults and children.. reduces brain fog. Vinpocetine is a compound derived from vincamine, an alkaloid naturally occurring in Voacanga seeds (Periwinkle). 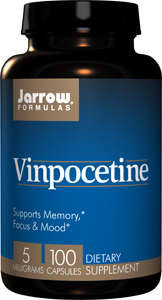 Vinpocetine supports brain metabolism by increasing cerebral synthesis of ATP (the universal “currency” of energy), enhancing brain metabolism by improving utilization of oxygen and modulating neurotransmitter release in areas associated with memory.